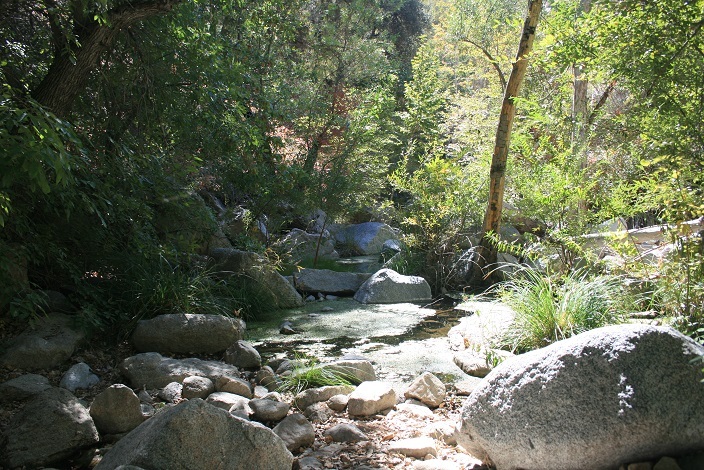 Location: Western San Bernardino Mountains north of Silverwood Lake and south of Hesperia. From I-15, take the Main St. exit and head east for a total of 12 miles. Main St. becomes Arrowhead Lake Road. At 12 miles, turn left on an unsigned spur, Saddle Dike Embankment on some maps. (If you reach Highway 173 you’ve come too far.) Park on the spur before the metal gate. From the north, take I-15 to Highway 18. Turn right and go a mile to Hesperia Road. Turn right and go 4.7 miles to Bear Valley Road. Turn left and go 1.3 miles to Peach Ave. Turn right and go 4 miles to Main St. Turn left (Main St. becomes Arrowhead Lake Road in half a mile) and go 5.2 miles to the unsigned Saddle Dike Embankment spur on the left. 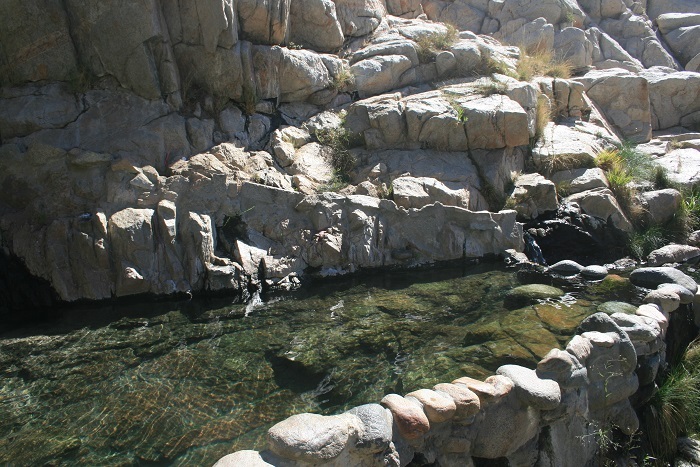 If you want to see Deep Creek’s famous hot springs but don’t want to deal with the fees or dirt roads required to access them from Bowen Ranch or the steep descent and descent on the Bradford Ridge Path, this approach from the west is worth a look. 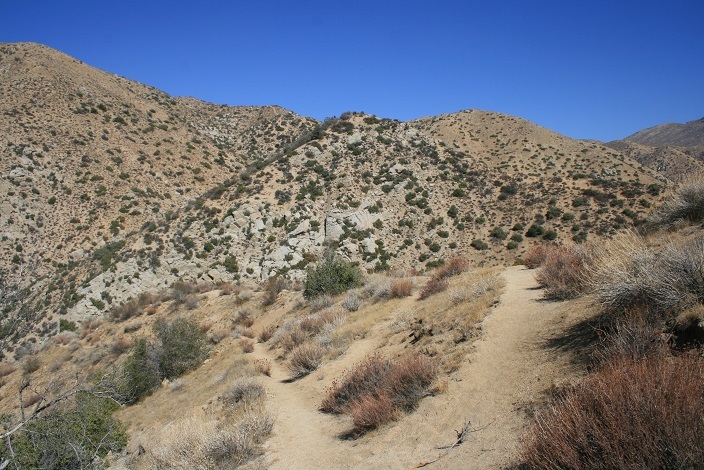 It’s the longest of the routes to the hot springs, but the grade is moderate and the trail offers nice views of Deep Creek, the San Bernardino and San Gabriel Mountains. 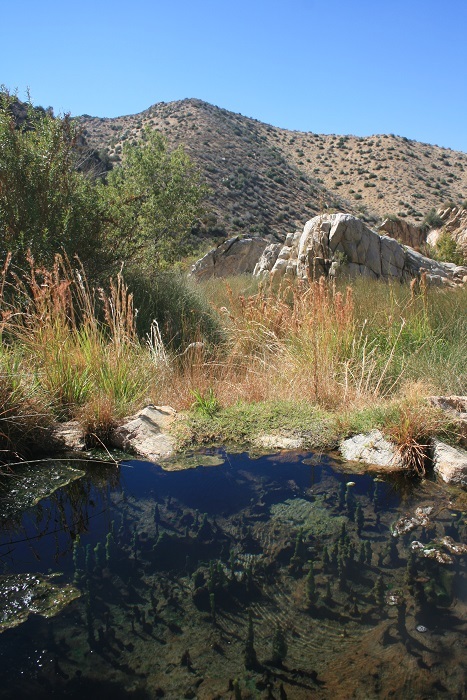 There’s an unfortunate amount of trash and graffiti, and hikers should be reminded that Deep Creek Hot Springs is popular with nudists. There are a few pockets of woodland on the trail but for the most part the route is exposed. From the parking area, walk around or through the gate. The first mile-plus is on a paved walkway and a dam that crosses Deep Creek. 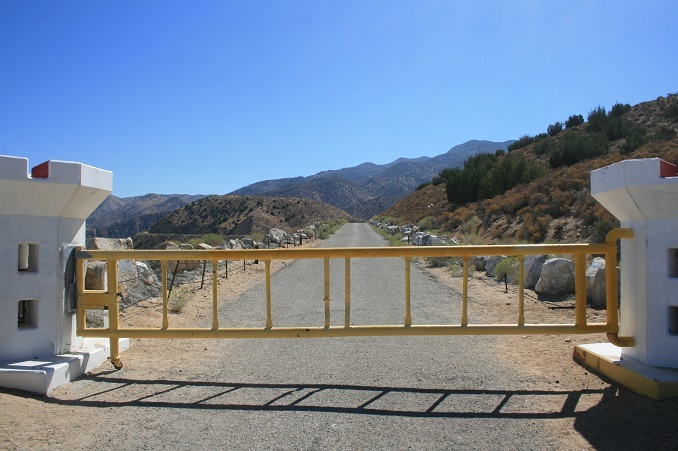 At the far side of the dam, head right and descend to a dirt lot where you meet the Pacific Crest Trail. 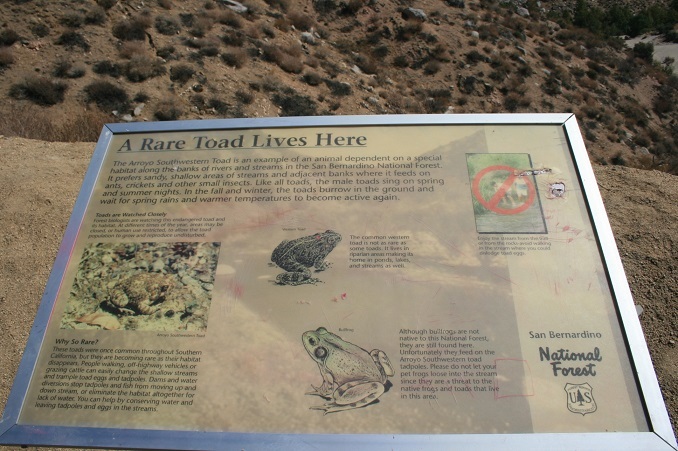 Interpretive plaques describe some of the wildlife in the area, such as the rare Western Arroyo Toad. Follow the P.C.T. as it ascends 200 feet in 0.3 miles. A few switchbacks have been cut and some fire breaks run down the hill, but you can follow the P.C.T. by keeping an eye out for its characteristic rounded triangle markers. 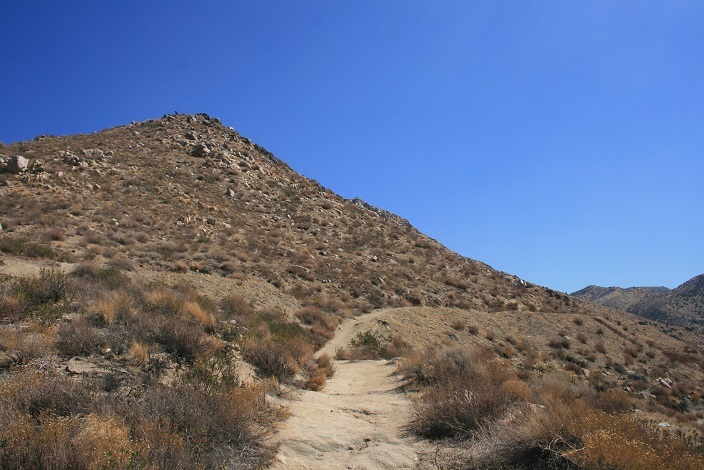 At the top of the ridge, make a hairpin right turn and begin heading east to Deep Creek. The trail is more or less level for the next 2.5 miles as it follows the north rim of the canyon carved by the creek. 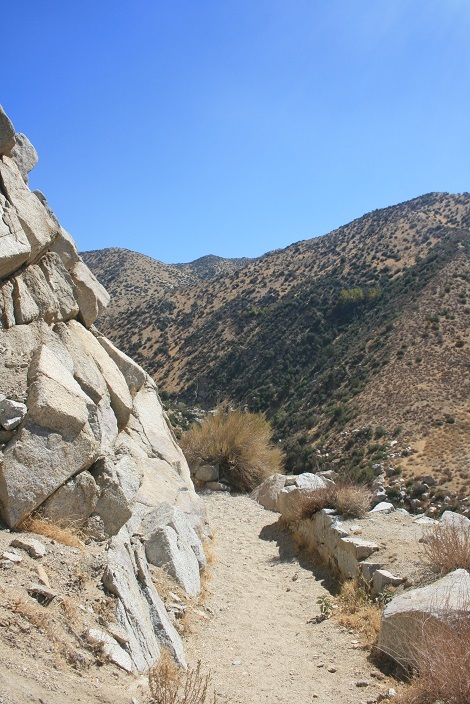 It cuts pretty close to the edge of the cliff, but except for one or two tricky spots, the terrain is easy to negotiate, and in several places a rock wall separates hikers from the drop. 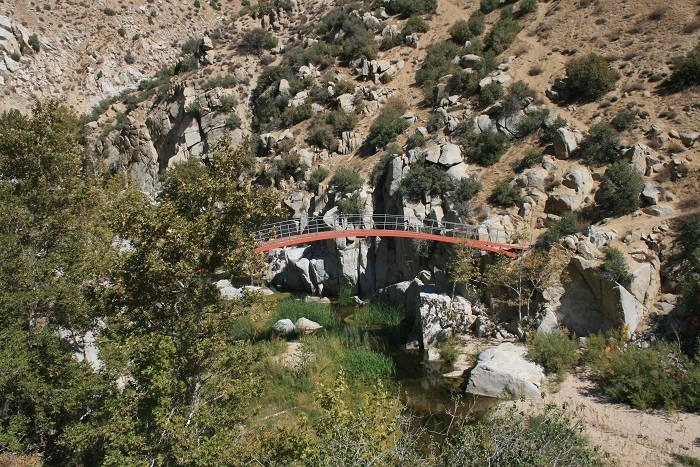 At 4.1 miles from the start, you reach a bridge that crosses the creek. On the south side, you make a few switchbacks and start ascending at a steadier pace. 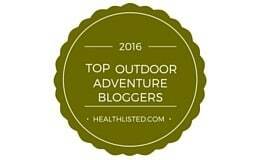 At 5 miles, you enter a pleasant grove of trees, but be careful of poison oak. This is the confluence of Kinley Creek and Deep Creek. Leaving the wooded area, you climb to a high point at 5.8 miles. 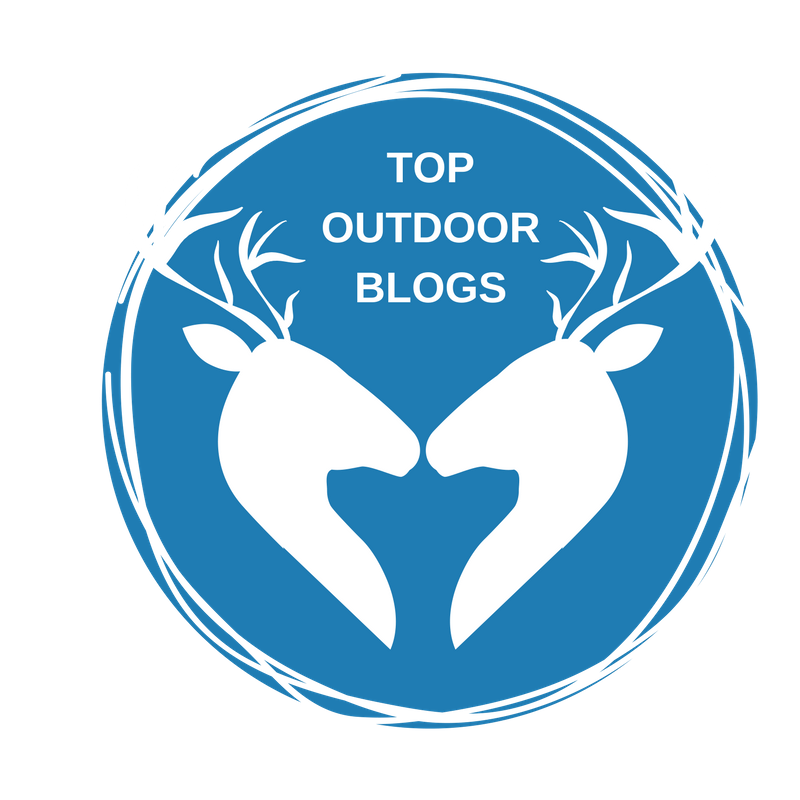 The P.C.T. rounds a bend and starts its descent. 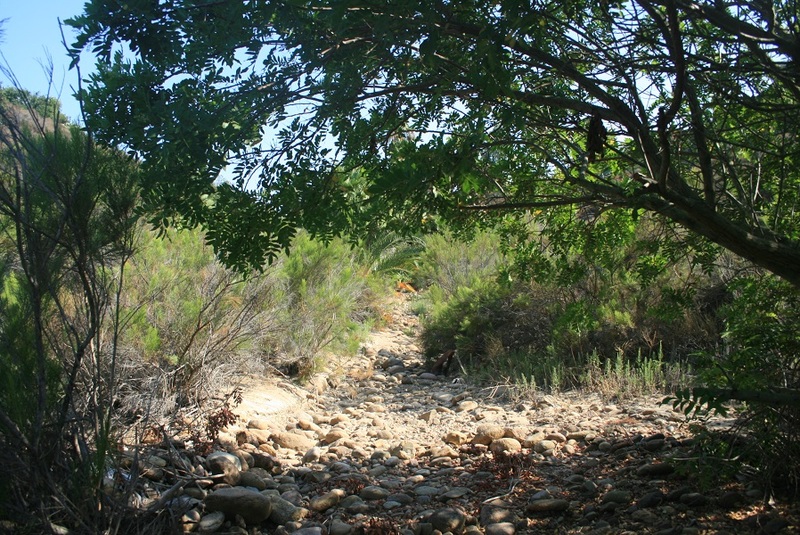 On the opposite side of Deep Creek, you may notice the route from Bowen Ranch descending the hillside. 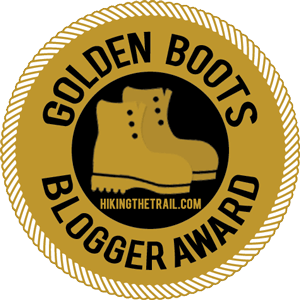 You drop about 250 feet, passing by the intersection with the Bradford Ridge Path, and at 6.3 miles, you reach the hot springs. You can soak your feet in the warm waters before making the long trip back.